DNA modifications that do not change the DNA sequence can affect gene activity. Chemical compounds that are added to single genes can regulate their activity; these modifications are known as epigenetic changes. 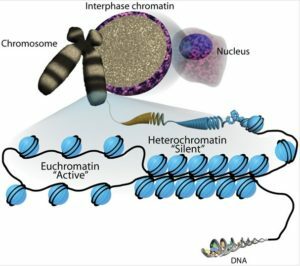 The epigenome comprises all of the chemical compounds that have been added to the entirety of one’s DNA (genome) as a way to regulate the activity (expression) of all the genes within the genome. The chemical compounds of the epigenome are not part of the DNA sequence, but are on or attached to DNA (“epi-“ means above in Greek). Epigenomic modifications remain as cells divide and in some cases can be inherited through the generations. Environmental influences, such as a person’s diet and exposure to pollutants, can also impact the epigenome. Epigenetic changes can help determine whether genes are turned on or off and can influence the production of proteins in certain cells, ensuring that only necessary proteins are produced. For example, proteins that promote bone growth are not produced in muscle cells. Patterns of epigenome modification vary among individuals, different tissues within an individual, and even different cells. A common type of epigenomic modification is called methylation. Methylation involves attaching small molecules called methyl groups, each consisting of one carbon atom and three hydrogen atoms, to segments of DNA. When methyl groups are added to a particular gene, that gene is turned off or silenced, and no protein is produced from that gene. Figure 3: The difference in chromatin packaging between an active (euchromatic) and inactive (heterochromatic) region of DNA.